Fraudulent activities in business have been increased alarmingly mainly because of weak internal control. Accordingly, the adequacy of internal control has recently become the primary concern of the government, public authorities and business executives.Understanding a corporation's financial management and compliance of internal control, the legal aspects of corporate crime investigation, and corporate criminality investigation and governance will assist all stakeholders to appreciate the importance of a proper organization internal control system and reduce the risk of corporate fraud. It is important to understand that the objective of corporate finance and internal control is to provide reasonable, but not absolute, assurance that an organization's management and control objectives have been met. Recently, the number of corporate crime has been increasing because of improper compliance of internal control in corporations. 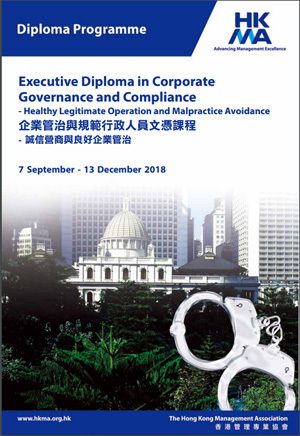 This course provides an insight into the legal aspects and principles of corporate crime in Hong Kong, together with fundamental knowledge in identifying corporate crime, and the essential skills and techniques in fraud investigation. appreciate the importance of corporate finance and internal control management. The programme consists of three modules. It covers the major areas of knowledge and techniques required by all levels of business executives interested in corporate financial management and internal control compliance, or officers involved in corporate crime investigation. It includes the study of corporate financial management and compliance of internal control; legal aspect of corporate crime investigation and, corporate criminality investigation and governance.